When was the last time someone or something left you feeling truly inspired? Inspired to the point that you later pulled out a notebook and pencil, and scribbled something down. Something others may think is crazy, foolish or even impossible. But something that could, if realized, change your life, the lives of those around you or even the world. Innovation harnesses the passion and creativity behind an extraordinary idea, but it wasn’t always framed so positively. In fact, advocates for the ratification of the U.S. Constitution, called Federalists, labeled themselves as “enemies of innovation.” But now, look around you. Our society is filled with examples of how someone ordinary changed the course of human history. I immediately think of the space program and President Kennedy’s commitment to land a man on the moon. It undoubtedly took more than one man to get there, but it was his innovative spirit that launched an entire movement. A movement that rallied neighbors, communities and countries as we ventured into the actual unknown. It’s also easy to think of examples from my personal experience, including the innovation fostered by my own father. He saw the potential of what a small-scale biorefinery could do for our family farm, and inspired others, including me, to see ag commodities as a source of energy. This small start led to 30 years of innovation at POET that today is changing the world. 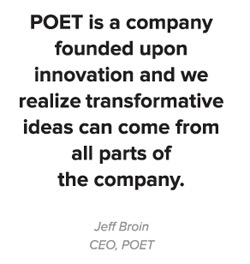 POET is a company founded upon innovation and we realize transformative ideas can come from all parts of the company. This is why we’ve implemented a program called Ideation, which gives team members the opportunity to submit suggestions which promote continuous improvement within our biorefineries and processes. In 2015, we had over 650 team member ideas! We plan on expanding this program in the upcoming year and I look forward to seeing what ideas will lead to innovation within POET and our processes. Back in 2007 when we announced we were changing our name to POET, we invited Neil Armstrong to share his thoughts on facing challenges in the pursuit of innovation. If anyone knows what it’s like to be told time and time again that a dream is impossible, it’s him. Neil Armstrong’s words hit home and spoke to the soul of our company. A company that has grown from a single biorefinery in Scotland, SD to one of the world’s largest ethanol producers in less than 30 years. 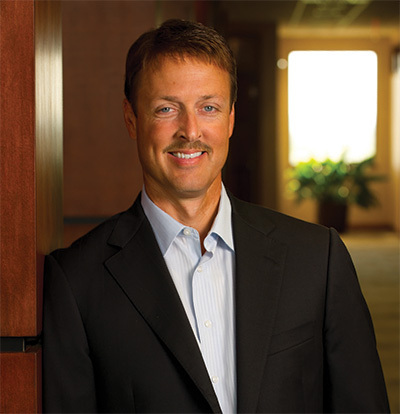 A company that has stood up to the oil industry. A company that dared to turn what others called a fantasy fuel into a reality with Project LIBERTY. The very essence of being human is to improve – to find a better way of doing things. POET sees abundance where others see scarcity. We understand the needs of our society and a healthy environment are not mutually exclusive. While we may not know for certain what the next chapter holds, I do know that if we keep our notebooks and pencils ready, I can assure you it’ll be an exciting adventure and I look forward to sharing it with all of you!